Eating sushi is as much an art as making the Japanese delicacy. When it comes to enhancing the flavor of sashimi or nigiri you’re not supposed to just drown your sushi in soy sauce. 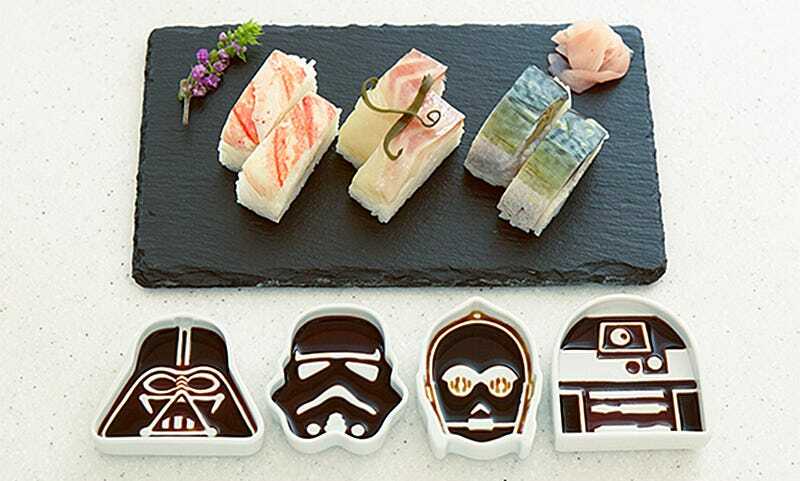 A light dip is all you need, and these wonderful Star Wars soy sauce dishes will make it easy to know when you’ve portioned out the perfect amount. Made from genuine Japanese Arita porcelain, the dishes still resemble Darth Vader, R2-D2, C-3PO, and a stormtrooper when empty. But the characters become more defined once the dishes are filled with the perfect amount of soy sauce—too much and their features will disappear altogether. If you eat sushi more than you like to admit, these will be an essential addition to any Star Wars fan’s kitchen cupboards—but they’ll cost you. A complete set, which arrives in a Star Wars-branded wooden storage box, will set you back about $100 if bought in Japan. Those of us living an ocean away will have to import them from sites like the Japan Trend Shop which is charging $230 to bring them across the Pacific. That’s a hefty premium, but can you really be expected to ever pour your soy sauce in a regular bowl after seeing these?